While scanning through some new tools posted on the blog Educational Technology and Mobile Learning by Med Kharbach, I came across this new online quiz create called Image Quiz. This tool allows you to post images and quiz students on structures and functions. Though it is still in its beta form, this tool has some great potential. In IB Biology, the list of structure-function diagrams that students are required to know is quite extensive. My seniors will be finishing their syllabus in the next couple of classes, and then the intensive two-year review begins as they prepare for their exams in May. During review, I typically provide my students with a list of diagrams that they need to be able to draw and annotate with the respective functions of different structures. This year I am thinking of incorporating this tool into this review process. For my purposes, I can see two key applications of Image quiz. The first is the simple labeling of structures. Below is one that I made for the male reproductive system. You can click through on the image to take the quiz. This is one type of question that students might get on a Paper 1 exam in biology. The second is quiz to test their knowledge of the functions of different structures. The plant diagram at the top of this post is an example of this type of quiz. Again you can click on the image to take the quiz. So this is how it works. You need to first select an image that you want to use for the quiz. You can either use a image URL or a file from your computer. You then fill out the fields on the screen above and go to create quiz. On the next screen, you outline the areas of the image that you want the students to click on and then you enter your descriptor. For example, in the image above, I would outline the germinal epithelium cell identified in the micrograph by drawing a box around the area in green. When I complete the box, I double click and a text box appears. Depending on what I want the students to do, I would either enter the name of the cell or I could write the function of the cell. You then click submit and then continue to outline structures. When you finish, you click submit outlines, and the quiz is ready to go. As I mentioned before, this is still in its beta form, so I have a few tips on how to avoid some of the issues that I encountered. Be sure to select an image that is large enough for outlining. Once you submit your title and image etc. you can't go back and change it for that quiz. You will have to start from scratch. A couple of times I used an image online that was too small once I moved to the outlining page. If this happens, just submit the outlines and then you will have the opportunity to delete the quiz. When selecting an image, be sure that you select one that has the area indicated with either an arrow or letter etc. if there are multiple areas on an image that they could select. 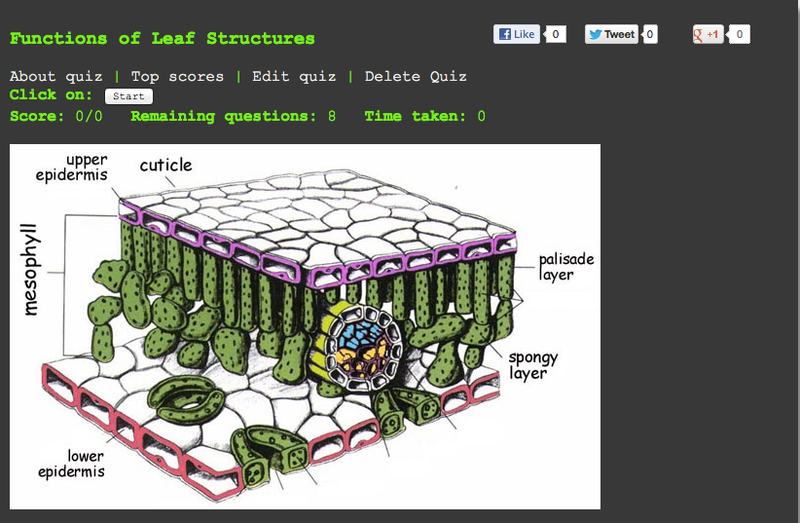 If you look at the leaf quiz that I created, there are several areas on the screen that could be selected for the palisade mesophyll. Since I cannot select multiple areas for one question, I indicated the areas that they were to choose from to turn it into more of a matching exercise. This of course is not necessary if you there is only one possible area to select. If you don't find an image that fits these specification, you can always use a image editing tool to create the image that you want as you can upload images from your computer. Skitch is a handy online tool for this purpose. Be sure to plan out how you want them to indicate their answers on your picture and include those instructions in your description. As long as you are logged in, you can edit the quiz after completing it. When it takes you to quiz mode, you will find both the edit and delete buttons. Here you can revise your instructions if additional instructions are needed. If you do make edits, this program will save it as a new quiz, so you want to delete older versions. These can be found under the "my submissions" tab. The outlining is pretty easy, but occasionally you make mistakes in your outline or it submits before you are finished due to a clicking error. If this happens, I just enter the word delete in the text box, and then when I finish my outlining, I delete all of these outlines by clicking the trash can image (see above). I have emailed the developer about these issues, so hopefully these will not be a problem once it is out of beta. Regardless this is an easy tool to use for both teachers and students. As part of my review, I am going to have students signup to create quizzes for each of the required diagrams in the syllabus. When I finish putting this together, I will post the assignment under the IB Biology lessons tab. For those of you teaching online classes or using blended learning in the classroom, this would be a great way for students to assess their understanding as they navigate the material. This would also be great for foreign language teachers for connecting vocabulary with images in scenes. If you know of an alternative tool that I could use, I would love to hear about it.